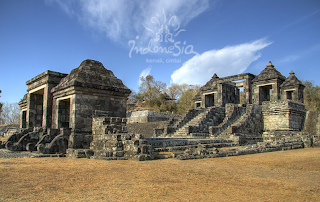 IndonesiaTravelVisit.com | King Boko Palace is a luxurious palace complex that was built in the eighth century. The most luxurious building during its time was built by one of the relatives of Borobudur founder. King Boko Palace was a glorious building that was constructed during the reign of Rakai Panangkaran, descendant of Sailendra dynasty. 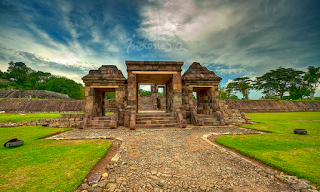 The palace that initially was named Abhayagiri Vihara (that means a monastery on a peaceful hill) was built for seclusion purpose and to focus on spiritual life. From this palace, you will feel peace and will be able to see Yogyakarta city and Prambanan temple with Merapi Mountain as the background. This palace is located 196 meters above the sea level. The area of the palace as wide as 250,000 m2 is divided into four, namely center, west, southeast, and east parts. The center part consists of the main gateway, square, Combustion Temple, pond, square terrace and assembly hall. Meanwhile, the southeast part includes hall, platform, three temples, pond, and a complex for princess. The caves, Buddha effigy, and a pond are in east part while the west part consists of hills only. If you enter from the palace gateway, you will directly be guided to the center part. Two high gates will welcome you. The first gate has three entrances while the second one has five. If you look it in detail, you will read 'Panabwara' writing on the first gate. Based on Wanua Tengah III inscription, the word was written by Rakai Panabwara (the descendant of Rakai Panangkaran) who took over the palace. The intention of carving his name on the gate was to legitimate his authority, to give 'power' to the gate in order to look more glorious and to give sign that the building was the main building. 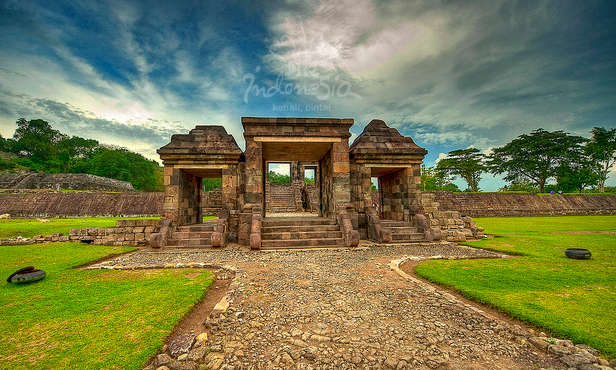 About 45 meters away from the second gate, you will see a temple made of white stones so that it was named Candi Batu Putih or Temple of White Stones. Close to the place, you will also find Combustion Temple. The temple is of square form (measuring 26 meter x 26 meter) with two terraces. The function of the temple is to burn dead body as the name suggests. Around 10 meters away from the Combustion Temple, there are sacred terrace and a pond. A mysterious well will be seen if you walk southeastward of the Combustion Temple. As the legend tells, the well was named Amerta Mantana that means sacred water treated with charms. At present time, the water of Amerta well is still used. The legend tells that the water brings luck for anyone who uses it. Hindu people use it in Tawur Agung ceremony, one day before the Nyepi day. Using water in the ceremony is believed to support the achievement of the objective, namely to self purify and to return the earth and its content to its initial harmony. 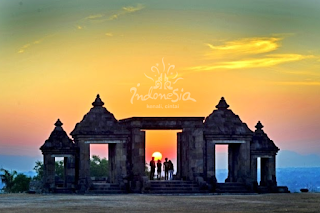 IndonesiaTravelVisit.com suggests that you visit Prambanan temple one day before Nyepi day to see the ceremony process. Moving to the eastern part of the palace, you will see two caves, big pond measuring 20 meters x 50 meters and Buddha effigy that sits quietly. Those two caves were formed of sediment stones. The upper cave is called Gua Lanang (Male Cave) and the lower cave is called Gua Wadon (Female Cave). Right in front of Gua Lanang, there is a pond and three effigies. Based on the research, the effigy is known as Aksobya, one of Buddha Pantheons. Even though it was built by a Buddhist, there are Hindu elements in it. This can be seen from the presence of Lingga and Yoni, Ganesha statue, and golden plate with the writing "Om Rudra ya namah swaha" on it as form of worship to Rudra as the other name of Shiva. The Hindu elements proved religious tolerance that is reflected in architectural works. In fact, Rakai Panangkaran who embraced Buddhism lived side by side with Hindu people. Not many people know that this palace is witness of the initial triumph in Sumatera land. Balaputradewa once fled to this palace before leaving for Sumatra when he was struck by Rakai Pikatan. Balaputradewa rebelled because he felt to be second person in the reign of Old Mataram Kingdom because of Rakai Pikatan's marriage to Pramudhawardani (Balaputradewa's sister). After his defeat and escape to Sumatra, he became the king of Sriwijaya Kingdom. As a heritage building, King Boko Palace is different from other inheritances. Most of other buildings are in the forms of temple or shrine, while this place - as the name implies - shows characteristics of a dwelling place. This can be known from the wooden poles and roofs, even though we can only see remains of stone building. Investigate the palace in more details and you will know more. One of them is the beautiful scenery when the sun is setting in the west. An American tourist says, "This is the most beautiful sunset on earth." 0 Komentar untuk "KING BOKO PALACE , The Glory on a Peaceful Hill"